All wedding stuff all the time!!! And squirrels. At least, that’s what my life feels like right now. (Ok, the wedding part, not the squirrel part, more on that later.) Anyway, I just wanted to let folks who might be in the shopping frame of mind know a couple of things. Bloomingdales, where we have a registry, has a BrownBag/Home/ComeBuyStuff Sale going on right now. Some of the stuff on our registry is marked down. Check it out if you’re looking for a deal. Ditto Macy’s. They’re having a Labor Day Sale with an extra 10% off and free shipping on purchases over $99. The code for the 10% is FALL. I am actually working on another post with media. It’s just being tricksy. Till then, have some squirrels. Geoff and I read this yesterday and it made us happy. The link to the original story is here. The content is pasted in below. The story of the nuns and the squirrels starts with a storm named Irene. Sunday, when the wind howled and the rain fell, it was too much for a tree in Somerville. And so it toppled to the ground – along with a pair of baby squirrels. That’s when the Little Sisters of the Poor, a religious order long hailed for its work with the needy, came to the rescue. 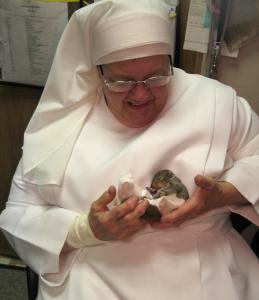 Sister Mary Vincent and Sister Kateri were attending to the storm’s wake Monday when they discovered the squirrels on the order’s Highland Avenue campus, where the nuns shelter 124 low-income senior citizens. The squirrels, said Emily Gilmore, director of development for the order, “were pretty cold and scared.’’ They were, maybe, three weeks old, their eyes still closed. And so the nuns, from an order dating to the 19th century, did something very modern. They went to the Internet, finding instructions on caring for baby squirrels. The animals were placed in a small, warm box near where they were found in the hopes their mother would return. She never did. The nuns fed the squirrels puppy formula and light cream every two hours. The residents named them Chester and Cashew. Yesterday, a rehabilitation center in Rhode Island came to take the squirrels, promising to keep them safe and healthy. Previous Previous post: Would you like some lockjaw with your jewelry?